Passengers in the front heard a loud explosion, while those in the back reported only small "jolts"
Passengers who survived the Metro-North crash that killed six people and caused the front of the packed train to burst into flames experienced everything from loud explosions to small "jolts" when the train hit an SUV stopped on the tracks in Westchester Tuesday afternoon. Six hundred and fifty people were on board train No. 659 when it slammed into an SUV stopped at a crossing in Valhalla at about 6:30 p.m., less than an hour after leaving Grand Central. 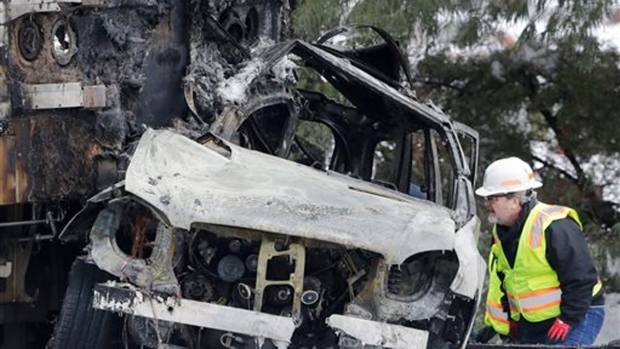 The train burst into flames and pushed the SUV nearly 10 car lengths down the track, killing the driver of the SUV and five passengers in the first car. Fifteen other people were hurt in the crash. Passengers sitting in the front of the train described an alarming scene following the impact, with many hearing a loud explosion before smoke filled their cars. Commuters in the back of the train reported only feeling small "jolts" or "jerks" upon impact. Survivor Chris Gross, 24, was sitting in the front train car watching a movie on his laptop when he suddenly went airborne, he said. "I heard a loud bang and a lot of screaming. People were screaming, 'Call 911, fire extinguisher,'" he said. "Flames came up, of which were about a foot away from my face," he said later. "And then after that happened, you know, people are screaming and crying." A quick-thinking passenger pried open the emergency exit and helped Gross escape. He said the five men who died on board the train were sitting right next to him. Jamie Wallace, who was sitting in the back of the second car, described escaping the train after the crash. "We started to hear people further up toward the head of the second car start to panic a bit, and they were calling for a fire extinguisher," he said. But as passengers rushed to help, "We could not get the head car doors open for some reason, it was jammed," he said. "We then were trying to break the glass to no avail." "A number of us started smelling fumes from the car, the fuel, and we said, 'You know what, we need to get out.' The fire was starting to spread back toward the second car, and the second car finally did ignite," he said. Another passenger, Fred Buonocore, was in the fourth car from the front. He hurt his fingers when he smashed his hand through emergency glass during the evacuation. "The thing that precipitated people really starting to freak out and break the glass and open the door was there was a loud 'bam,' explosion-type thing, and once we jumped off the side, there was another explosion to a lesser degree," he said. Neil Rader of Katonah was sitting in the middle-back of the train when he felt a "small jolt." "It felt not even like a short stop, and then the train just completely stopped," he said. He said passengers in his car also had to evacuate by breaking glass on the doors to get out. He said he saw 50 to 60 ambulances at the scene as he walked to a nearby gym, which was acting as a holding area for the escaped train riders. "I've never seen anything quite like it," said Rader. Stacey Eisner, an NBCUniversal News Group employee, was sitting in one of the rear two cars of the train, and said she felt the train "jerk" at some point. The conductor walked through the train to explain what had happened, and passengers were calm at first, but tension began to build when they learned the train had hit a car, she said. About 10 to 15 minutes after the train "jerk," Eisner's train car was evacuated, with ladders used to get people out. People were taken either to a nearby rock-climbing gym called The Cliffs or allowed to walk to the Hawthorne Funeral Home, she said. Amateur video captured at the scene shows frantic passengers crowding a train car's aisle to get out, then trudging through ankle-deep snow near the tracks. The train engineer, identified by sources as Steven Smalls, sent out an emergency call after the crash and went back to the burning train several times to help carry people out of the first and second cars, said the sources, who spoke to Smalls afterward. He put a jacket over the legs of one victim in the first car because they were so badly wounded, the sources said. Ryan Cottrell, assistant director at The Cliffs, told NBC News that the passengers who were brought there appeared to be shaken up but generally OK.
Staffers who saw the incident from the front door went to the scene to help bring passengers into the gym, where they were providing shelter and warmth until MTA buses arrive to transport commuters to Pleasantville, Cottrell said. Buonocore, a Ridgefield, Connecticut, resident, told NBC Connecticut he normally sits in the front car and happened to be running late Tuesday before he ran to slip into a middle train car. Updated911 Operator to Teen Whose Dad Is Fatally Hit: "Stop Whining"
"To come to the realization that people in the train actually died was really a frightening concept," said Buonocore.